Prior to Sky driving, I already knew how to drive from previous instructors. But in reality, I didn´t know how to drive at all because the approach I was taught relied heavily upon instructions and theory and not logical or practical sense. But Abida, you changed all that for me by teaching me, with much patience might I add, to drive practically in a true to life way. I am incredibly grateful to you for having had so much patience with me when I repeated the same mistakes and for being an amazing instructor/teacher. You didnt just teach me to drive, you taught me to have patience, to be considerate with fellow drivers, you encouraged me to be confident in my decisions and to learn from my mistakes instead of dwelling on them. I am genuinly glad I asked for you Abida, and I sincerely thank you for all the things you have taught me. I never thought I could pass first time, but I had an impressive driver as my teacher who i could not have done it without Alhamdulillah. 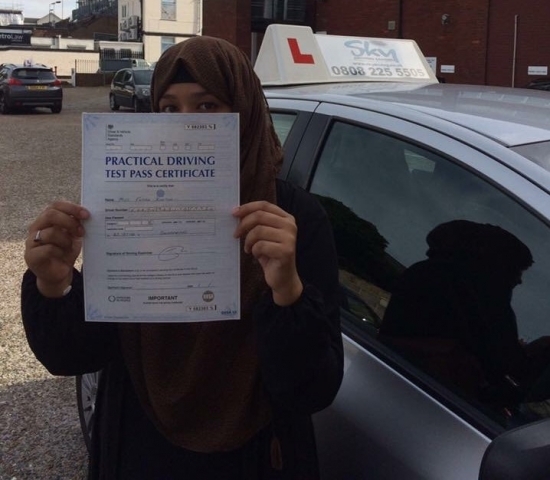 I highly recommend Abida and Sky driving for anyone wishing to pass with a set of solid driving skills. Thank you again, whether you had other stresses, or not, you always had focus in our lesson and gave me all the support and advice I needed to succeed. When I start driving by myself, i´ll always remember my teacher...Abida at Sky Driving School 😘 😘 😘"